The new Timeline format for Facebook Pages, introduced in early 2012, offers exciting new opportunities for reaching audiences with your brand story. Early marketing research indicates the Timeline format can help enhance engagement and interest in your brand. A study by Simply Measured showed an average increase of 46% in engagement per post and a 14% increase in overall fan engagement for pages that have moved to the Timeline format. With the Timeline format, it’s important to have a clear understanding of how to best leverage its components and features in order to optimize the brand experience on your pages. We provide custom social media services in Columbus, Ohio to help build your brand on all social media outlets. Facebook Page design and marketing is just one area that Columbus Website Design specializes in within the social media realm. We also specialize in creating Twitter feeds for your website, installing Facebook “Like” boxes and giving your website viral exposure through a wide array of social networking services including LinkedIn, YouTube and more. Why does everyone love Facebook? It seems like Facebook love is in the air. Most every custom website project we build whether it is for mobile or desktop, typically includes some level of social media integration with Facebook and Twitter being the number one and number two requests. We can integrate Facebook “Like” boxes, as well as Twitter feeds right into your website. Your visitors will be able to “Like” your Facebook Page or Follow you on Twitter with just one click. Another popular feature is “Send to a Friend” which allows your website visitors to email a link to the current page, along with a brief message, to anyone’s email address. With the help from third party services, we can give your website viral exposure. Third party services such as ShareThis allow us to put Facebook, Twitter and LinkedIn icons on your website. When your visitor clicks the icon, they are are prompted with a pre-filled in status message to the corresponding social network. The visitor can then share a link to your website with a predefined message to their Facebook friends, Twitter Followers or even Google+ Circles. Pricing varies depending on the client’s social media requirements and the amount of profiles that need to be created. 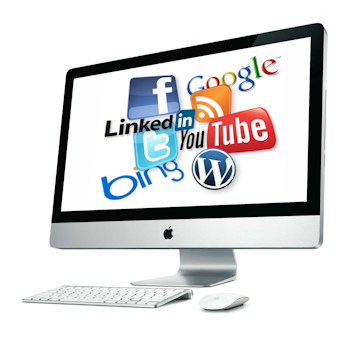 Rest assured that you are receiving a great value for social media marketing services from Columbus Website Design. Typically, graphic design projects are charged based on the type of project and a flat fee estimate based on an hourly rate of $75.00 to $95.00 per hour depending on the project requirements. We bill all projects in 15 minute increments to remain fair to the client.